Music and football go together like a pint of a pint of beer and a steak pie. Throughout the history of football whenever supporters have gathered together to get behind their respective clubs, reworkings of popular songs have always been a key part of the proceedings. Probably the most well known song in all of football, it is sung by fans of Celtic in Scotland but is of course more famous as the anthem of Liverpool Football Club. Written as a show tune by Rogers and Hammerstein in 1945 for the musical Carousel, it was later famously recorded by the Merseyside pop group Gerry and the Pacemakers in 1963. Shortly afterwards it was adopted by the Liverpool faithful and has been a key feature of matches at Anfield ever since. Written by the famous Spanish composer Jose Cano for the club's centenary celebrations in 2002, and originally sung by the legendary tenor Placido Domingo, Himno Del Centenario has become one of the official anthems of Real Madrid. Although, it's hard to imagine supporters singing it with as much gusto as Senior Domingo. 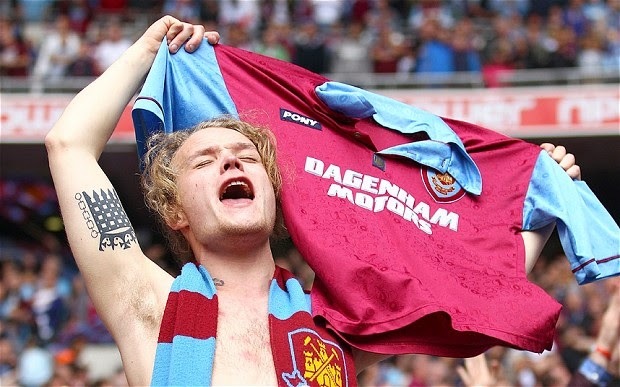 Although it's an odd song to have gained popularity on the terraces, I'm Forever Blowing Bubbles is probably second only to You'll Never Walk Alone as the most famous anthem used by an English football side. Written in 1919 by American composer John Kellet for the Broadway musical revue, "The Passing Show of 1918", the song was adopted by West Ham fans in the late 1920's after being introduced to it by former manager Charlie Paynter. This famous Geordie anthem was written by George Ridley as a Music Hall song in 1862. Blaydon Races is unique for highlighting the local areas around Tyneside and the words are sung in the unique Geordie dialect. Personally I can't understand the majority of the lyrics, but once the St. James Park crowd is singing it in full voice it's quite incredible to hear.